When dragging in a new thought from whatever source, divide the "Plex" into three (3) discrete "release zones". 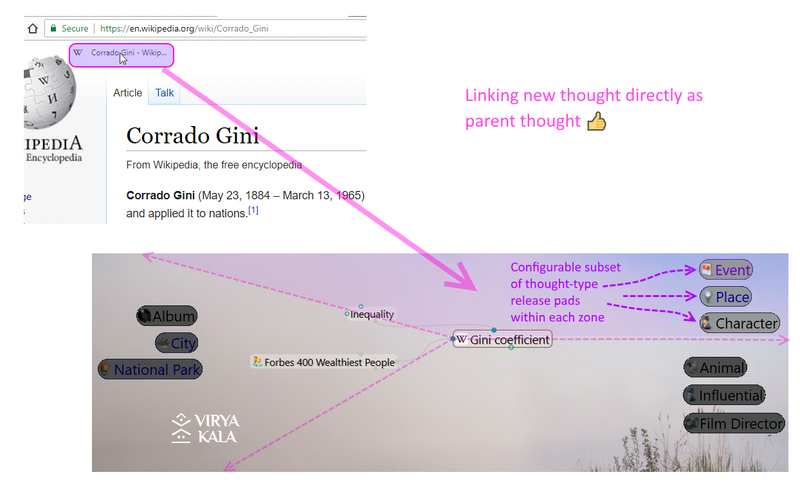 Regardless of Plex layout, if using the selected thought's "jump" gate's (x,y) coordinates as the base, the user may be able to immediately create not just a child link, but also a parent or jump link as the connection context to the existing selected thought. Roughly speaking, 3 - 8 seconds of a user’s time will be saved in this manner for 66% of the possible use cases of this feature each and every time a new thought is added. Intuitively, adding a "child" link may seem like the most natural use case, but I doubt seriously this would be empirically substantiated given a proper UX research evaluation analysis across the full product's user-base. The time savings note above would be constituted by the following steps which would be obviated should this feature be implemented, unless, obviously, the user incorrectly releases the mouse button within an unintended zone of course, in which case the steps below still apply to resolve the mis-release of the mouse. * If "Normal" Plex layout view is selected, the above steps can be slightly simplified (larger mouse target of the whole thought vs. the specific gate itself) to a more simple move/click/drag/release series of steps in which the thought is moved to this sort of three zone grid already, so obviously time savings may be marginally less in Normal view but this re-link feature is not supported at all, at present, within Outline or Mind Map view at this time. ** I'm a fan of having the researcher's intent be captured as early on in the UX as possible, so while a workaround simplification may be to suggest that users "use normal Plex layout" mode for adding new thoughts to their databases, I'd argue strongly that this fails to capture the user's intent and is an artificially imposed impediment for the user's most efficient flow, not to mention, some users may NEVER wish to actually use the normal Plex layout for their research. *** Hotkeys are not taken into consideration for this feature request. I'm not aware of any hotkeys available to "reassign" an existing child to be a "jump" of its parent however, so I'm pretty sure this hotkey case would surely be an edge case. +1 for target zones for adding child, jump and parent thoughts -- Great suggestion! You could drag the Thought to the new location immediately after auto creation. Drag the item in, let the Thought be generated, grab the Thought itself and drag to the zone you referred to. There will be a dashed link showing which gate it will attach to. Can you be more specific on how this is accomplished? I'm not following given the description above. I think you're referring to what I noted above as the "normal layout" workaround. You can drag a thought to change it from a child to a parent or to a jump thought. It takes much less than "3 - 8 seconds." @shatcher, @Cerebrum, please re-read my "Supplemental Notes" section within my original post. This "drag a thought" feature is NOT supported in any other plex layout other than "Normal". I fully support and encourage this "drag a thought" feature, perhaps with on/off config toggle to enable/disable as per users' preferences, for all plex layouts. It is great! Although, again, as per my original post, the researcher's intent is not being captured at the initial step thereby requiring a second sequence of steps to accomplish the goal. Re-linking is a workaround in any context. Researcher's Intent, again, to reiterate ==> I want to spawn a new parent thought or jump thought at the time of dragging my URL onto my plex. I just gave this feature another think ... and I'm really liking the idea of adding some time-saving shortcuts into the flow to allow for thought types to be applied in one step to the new incoming thoughts and/or assigning an initial link type to the newly established connection by way of "dynamic release pads". A simple example of thought type release pads is illustrated below. 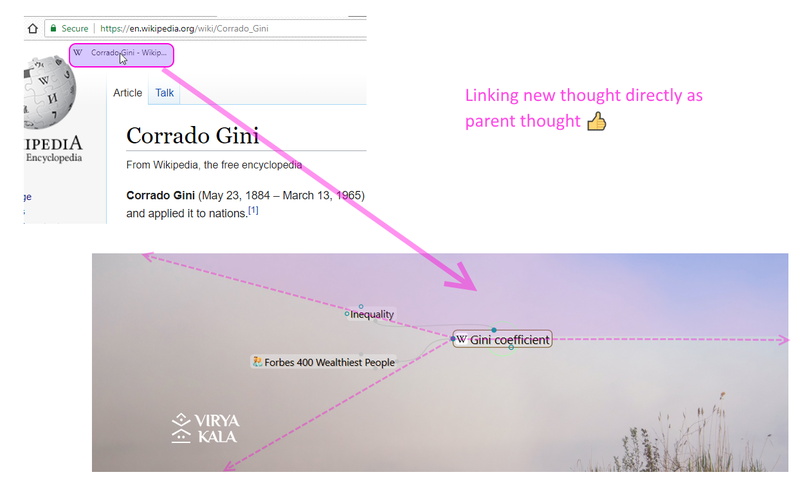 Something similar and/or a more advanced two step flow to include both a thought type assignment and a link-type assignment could be explored if taking this feature forward in earnest. 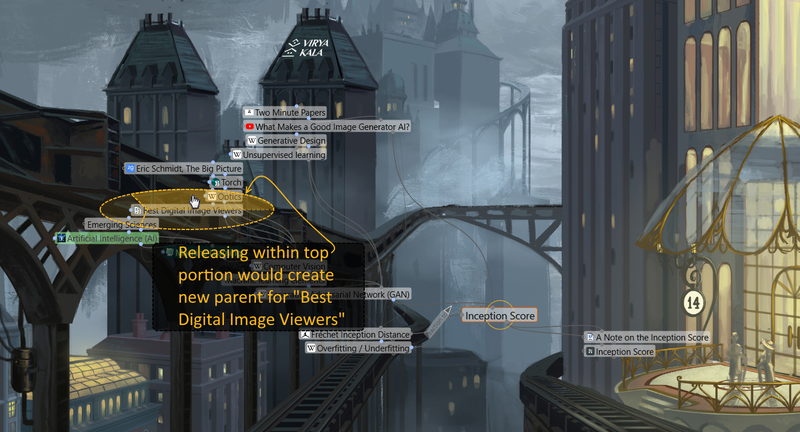 These could be user-configurable to allow for certain thought types to be shown as parent/child/jump options when linking new content. Hierarchically speaking, some thought "types" are conceptually obvious to allow as new parents or new children within my own brain, for example, when the active thought is of type "film", linking a child thought might surface a "character" thought type which makes sense for my hierarchy, but someone else might like to have characters as parents and the film thought type as the child thought type instead. A few UX explorations would be good to help guide users through the creation of hierarchy guides and establish a few best practice examples for out of the box day 0 experiences for new users. Loosely linking thought types to a hierarchy would allow for these suggestions to be user defined, highly useful, and dynamically relative to whatever the active thought might be. The more I use TheBrain, constantly looking for efficiency improvements, the more fun features I keep circling back around to. 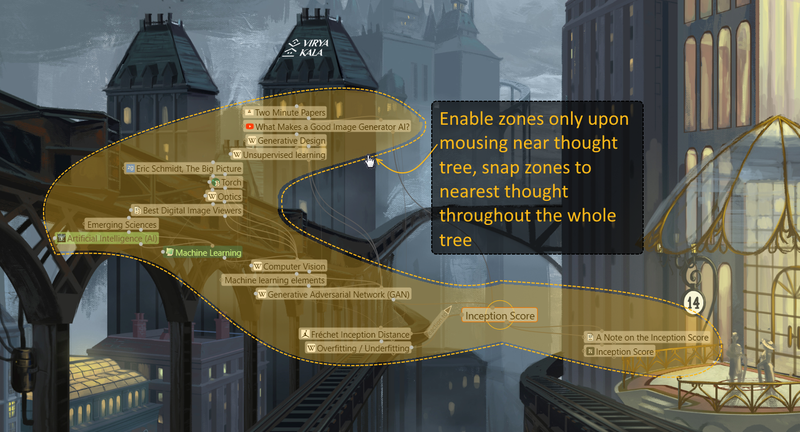 To extend this feature one step further, I'd like to introduce the idea that the new thought release zone's location can become a narrow oval around any thought presently on the canvas. Given that this is a mouse action, user precision should be plenty high to accomplish this within the desktop app. I get that, technically speaking, the ease of listening for any mouse unclick drop on the plex becomes an easy and deterministic "add link to active thought" function, but how about we expand this experience by providing a richer release zone canvas across the entirety of the plex? If this complexity would only serve advanced users, then have it be toggelable within settings. 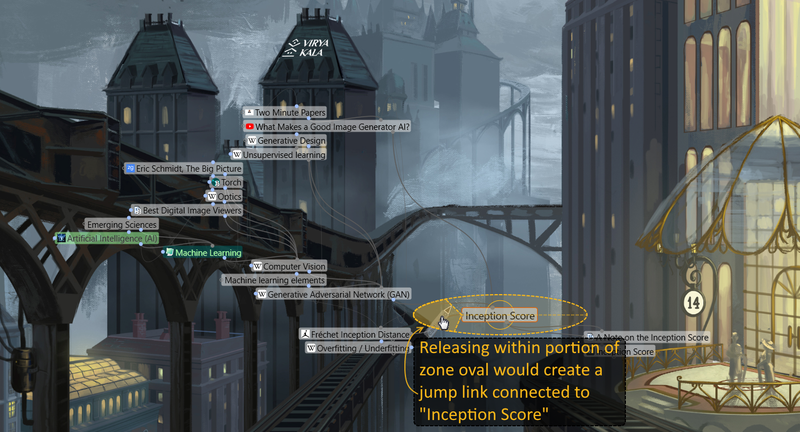 Below is what I'm thinking when releasing near the active thought "Inception Score"
Below is what I'm thinking when releasing near the non-active great-grand-parent thought of "Best Digital Image Viewers"
The multi-drop zone paradigm could be highlighted for feature discoverability by lightly emphasizing the valid plex drop-zone area by roughly outlining the thought tree and only then activate the actual new thought drop zones themselves when close enough to the thoughts themselves within the zone. If I keep working through the UX here, I know it would be quite possible to auto-assign a thought type as an optional 2nd step in the drop process in this more advanced approach ... but I need to get back to some of my own other work here soon before I fully re-envision and expand upon TheBrain's plex patents without being considered to be added as a supplemental named inventor for any new IP claims made. I love TheBrain, but (and not the but that totally negates my first statement) free-work generating valuable UX IP has to stop at some point. I sure would love to see the team leveraging their valuable market dominance more efficiently and drastically expand the scope of their R&D into all sorts of knowledge aggregation, management, data visualization, and content generation user workflows. No other app out there is poised to so seamlessly tackle this domain space and allow for individuals to maintain full offline-ownership as TheBrain can as I see it.